No-bake, no-fuss! 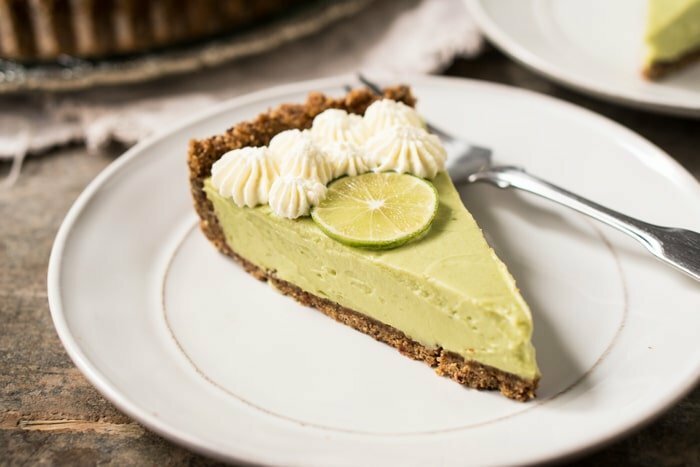 This gluten free, paleo and keto key lime pie is extra creamy, citrusy and with all good-for-you ingredients! 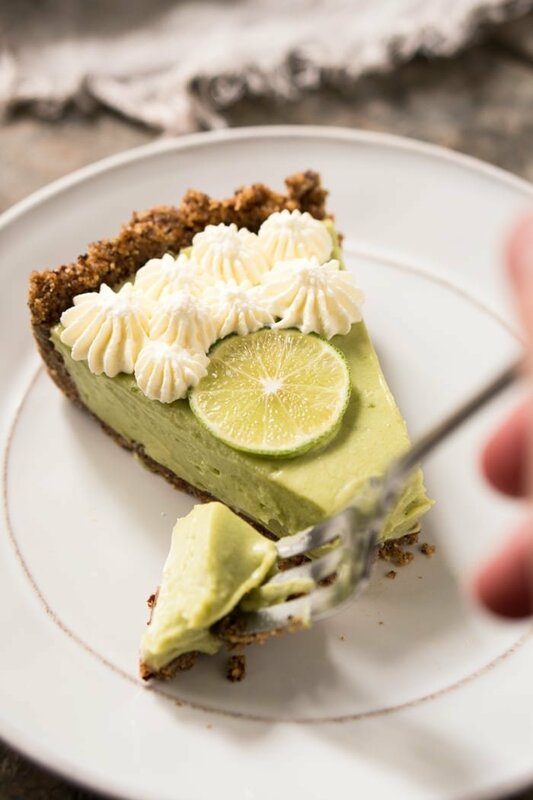 That’s right, this low carb key lime pie is a breeze to whip up! And, arguably even more important, without losing any of that explosive citrus kick you know and love. Key limes, otherwise known as Mexican or West Indian limes, are smaller (yet a lot tastier!) than conventional ones. When at their prime, they’re characterized by a bolder and more acidic punch. 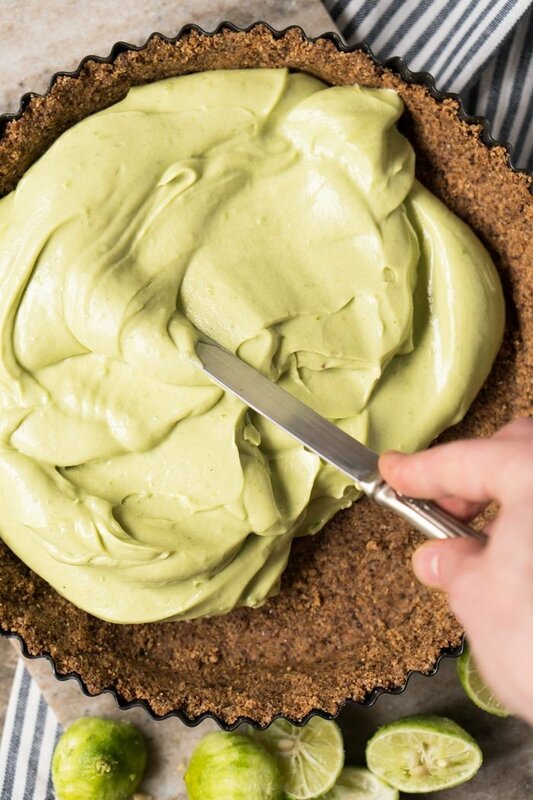 And, as the name suggests, they’re the star ingredient of this low carb and keto pie. Still, you can go for regular limes too! And don’t skip the instant ‘graham cracker’ crust, it’s a-mazing (and easy-peasy, so no excuse). 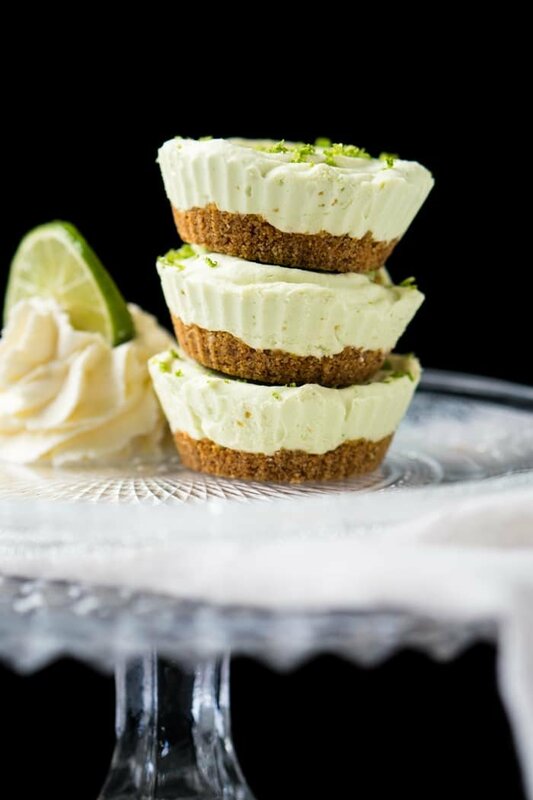 Just like our key lime cheesecake-for-1, feel free to adjust the serving size for this guy and whip it up as fat bombs. And be sure to keep them handy in your freezer for fresh keto treats! You can pretty much use whatever sweetener floats your boat here. 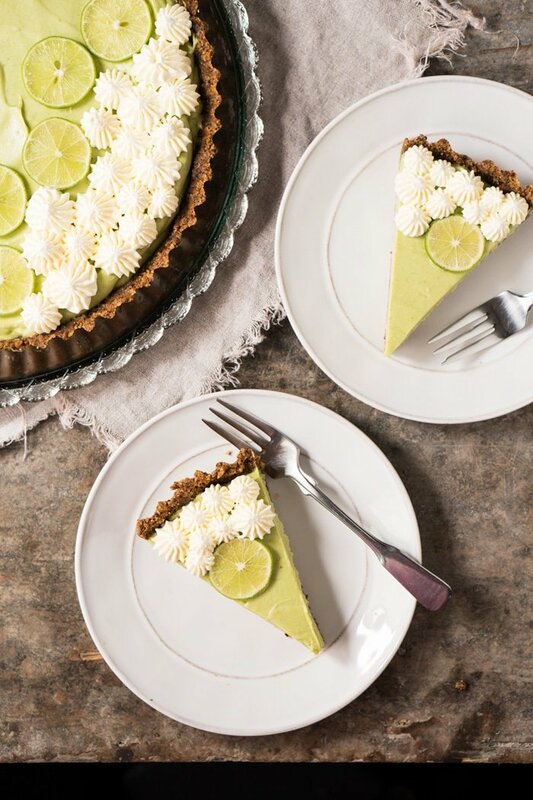 As even though you’ll get slightly different tasting results with each sweetener, the key lime zest is pretty good at masking aftertastes. But the sweeteners must be powdered. Think erythritol (Lakanto or Swerve), xylitol and Pyure (at half the amount). And if paleo (or not restricted by sugar), coconut sugar is your best bet here. My favorite for least aftertaste is xylitol, but you’ve got options. You can even use stevia drops and pure monk fruit here too. For real, use whatever floats your boat. Lightly toast almond flour in a skillet or pan over medium heat, until fully golden and fragrant (2-4 minutes). This is very important taste-wise, so don't skip! Transfer toasted almond flour to a medium bowl, and mix in sweetener, cinnamon and salt. Add in butter, mix until thoroughly combined, and press into an 8 or 9-inch pie dish. Allow to come to room temperature and freeze while you make the pie filling. Blend all the filling ingredients (starting with the lower amounts) together using an immersion blender (or high speed blender) until creamy smooth. Taste for sweetness, tanginess and seasoning and adjust accordingly. Key limes can vary a lot in taste, so start with the lower amount and add to taste (keeping in mind that the flavors will develop while chilling). 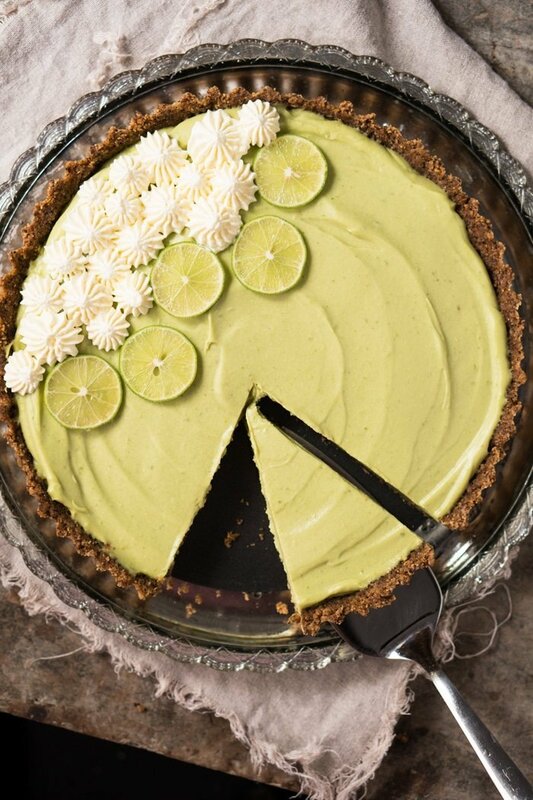 Spread the key lime filling over the graham crust lined pie and refrigerate preferably overnight (the key lime kick becomes so much better!). But if in a pickle you can always pop it in the freezer for an hour or so. Keep in the fridge for 3-4 days, and frozen for a month or two. * Please see section on Sweeteners for more deets on powdering and sweetening options. 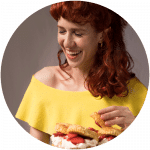 **Coconut cream is the thick part of your full-fat canned coconut milk, and it's easiest to separate it by refrigerating the unopened can overnight and scooping out the cream, discarding the water. Please note that nutrition facts were estimated per slice, assuming a yield of 10 slices. And, you can always lower the carb count by decreasing the thickness of the crust (you can get away with even 1-1 1/2 cup of almond flour). This came out awesome! 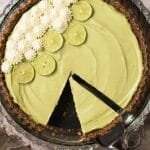 Key lime is my husband’s favorite pie and he said I’d knocked it out of the park. I said silent thanks to you 😀 . 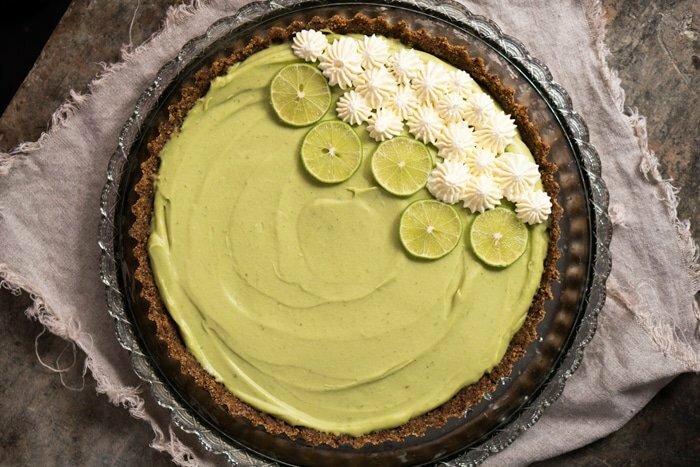 I used Lakanto monkfruit with Erythritol for sweetener and most of a huge Florida avocado, as that is what I had on hand. Thai kitchen sells coconut cream in a can, so used up the whole can. Thank you so much for this healthy low carb pie. I didn’t have coconut cream in the house. So I substituted creamed cheese. Taste amazing! That sounds great! Did you leave the cream cheese to get to room temp? Any avocado substitute? This looks good but hubby can’t have avocado and we are dairy free. More coconut cream?? I would try soaked cashews, almonds, or macadamias made into a puree, or cashew or macadamia butter (less). If this doesn’t set up enough in the fridge, add some coconut oil to help it set. Also if you want it green add a small handful of baby spinach or lightly steamed spinach, or something similar. Yeah fair enough. I would only use maybe 4 or 5 baby spinach leaves in the whole pie, which wouldn’t give much presence. The avocado version I made did taste of avocado to be honest, which was odd, but I don’t know. I used the weight of avocado suggested. Mmmm thanks for letting me know Bob! Someone else did comment the same thing for the first time (today in fact! ), so I’ll take a look. Honestly when you add fresh ingredients some variables are bound to change (my key limes could’ve been more zesty etc). xo! I have been loving all the recipes I have tried from you, but I am having trouble with this one. I’m not sure if it’s the sweetener (I only had stevia on hand), or if I used too much lime juice/zest, but it came out very tart almost like a sour avocado, and pretty much inedible. The crust: perfection! I made it into little muffin cups for a “fat bomb” and was making them to share so I doubled the recipe and got 72!! Maybe I didn’t add enough sweetener? I could dip them in chocolate…ha! Or maybe it was because i doubled it? Sometimes recipes have trouble doing that. Any suggestions or insight? Oh- I loved both the cookies n cream and cookie dough fat bombs. Amazing! The cookie dough ones are so simple! And the cookies n cream ones are wonderful with the added coffee flavor. Just beautiful! Ingredient called for “1/4-1/2 cup powdered xylitol”, however the link is for granulated xylitol. Which is correct? I just whipped this up, and it’s chilling in the fridge right now. Mine does look a lot greener than in your photos. I wonder if it’s the coconut/avocado ratio? I did weigh both, but maybe I needed more coconut cream. Oh well… it tastes great! Could also be the avocados? When you use natural products they’re always bound to be some variations! Let it hang out in your fridge if you can overnight for best taste (tastes great after even just a few hours, but you’ll know what I mean tomorrow!) xo! Thanks for this recipe. Going to make today. Are the measurements (I’m using ounces) for the coconut cream and avocado by weight or by volume (fluid ounces)? In other words, should I weigh them or measure in a liquid measuring cup? Thanks! Hi. When I click on the US button to convert the measurements to cups it works great on the screen but most of it reverts back to grams when I click the print button. I’ve been writing the conversion on the printed recipe by hand but would be nice if I didn’t have to. Do you have any idea why this would happen. Thanks. This looks truly amazing… can’t wait to try the recipe! Thanks so much for sharing this and so many others too…. Thank you Liz!! Hope you love it!! That looks totally amazing! Was searching for a no bake cheesecake like recipe when I bumped into this one. 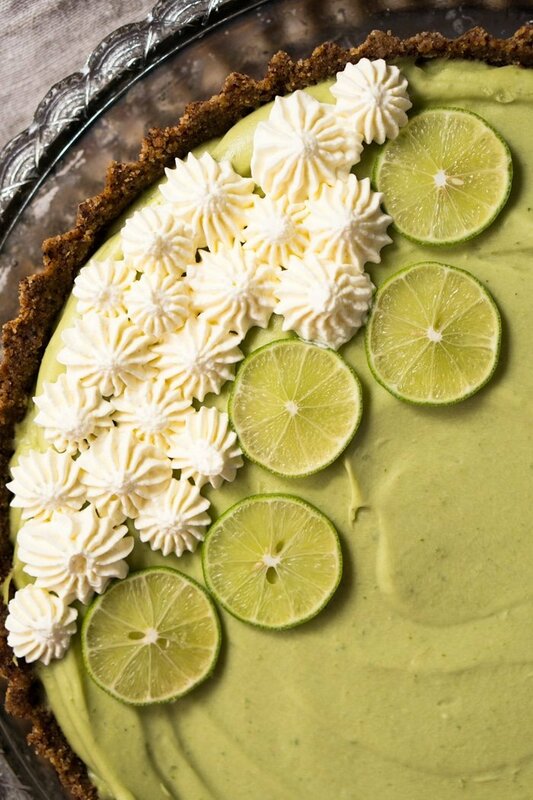 And I love lime in everything so will be making this next week! Can’t wait to try it! 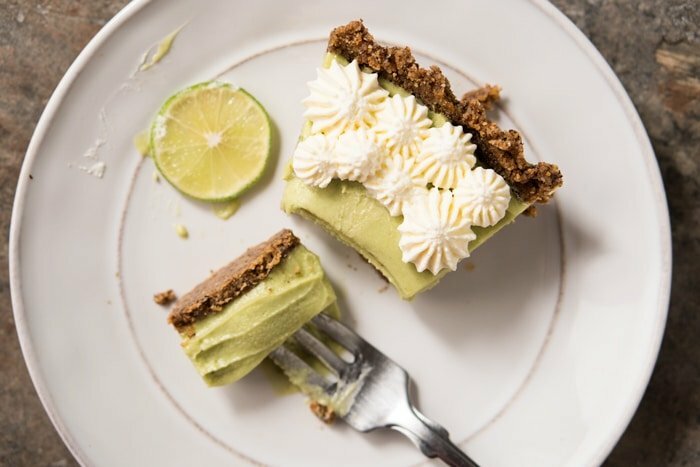 how do i make the white whipped cream on the top? Oh, Paola, I am so confused. 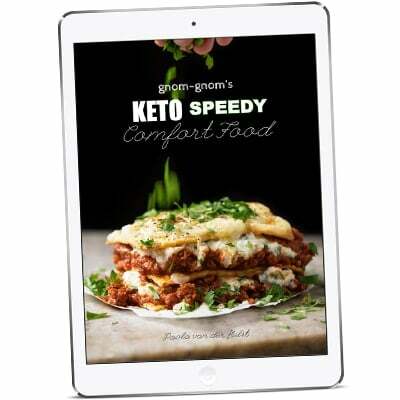 Regarding the instructions for the KETO GRAHAM CRACKER CRUST, you say, “Allow to come to room temperature and freeze while you make the pie filling.” What ingredients are not already at room temperature? Please help me understand. Hi LaWanda! Since you toasted the almond flour and the butter is melted, your mix will lightly be a bit warm 😉 xo! How many cans of coconut milk does it take to get 9oz of coconut cream? This might vary a bit from brand to brand, but I used 1 xo! Love you and your recipes but, do you mean No Fuss? I am sure there isn’t any fuzz either but I thought I should just make sure. Can you tell English is my third language ;)! Thanks Linda had a great laugh!